Deep Green Stain Remover is an innovative, user-friendly product that extracts extremely difficult stains from any washable surface or fabric. Our odorless, dye-free product cleans by deeply penetrating porous surfaces. Deep Green’s effectiveness relies on the balancing of conditioners, natural softeners, and an ingredient that makes water itself “wetter”, thus allowing for a thorough and deep extraction of stains. Deep Green leaves surfaces and fabrics film-free, without residue or discoloration, while restoring it’s original color, luster, and shine. Let Deep Green do the work! 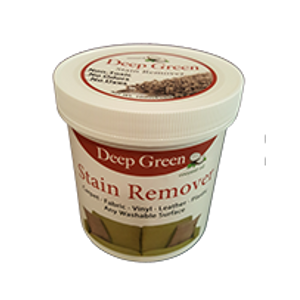 Restore value to your personal and professional environments with Deep Green Stain Remover.